When Mixed Bag Media approached GLUE to create its company ident (an ident or identifier is an animated version of a logo, sometimes called a stinger), we were delighted an award winning Irish film and television production company would trust us with their logo in 3D. The feature film release of “A Nightingale Falling” has this animated ident in the opening credits – book your ticket to the first screening today 12/09/14. This blog post will detail some of the elements used to create this logo in 3D. 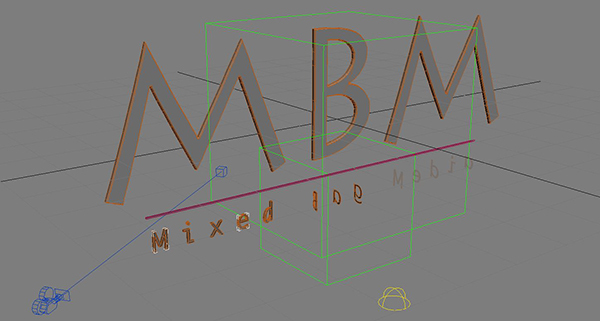 The below image shows the wireframe, shaded and rendered (the process of automatically converting 3D wire frame models into 2D images with 3D photorealistic effects) version of the logo in 3D. Adding a HDRi environment and creating a bump texture really helps the 3d text stand out and defines the material. Also, in the above image in addition to the text itself, you can see the grey grid used in 3D space, the blue camera and target, a yellow skylight to project the HDRi environment and two powerful green boxes called “Dummies” which are used to link objects in the scene to enable a more controlled animation process. After the logo in 3D animation is rendered, we move on to compositing which is the process of digitally assembling multiple images to make a final video. Extra elements such as smoke and dust are composited in and the final touches of a few lens flares are added. Depth of field blurring finishes the logo in 3D ident off before its sent for audio production. In the YouTube video below you can see our work in the first few seconds of the “A Nightingale Falling” trailer. You can find more info about this feature film on the IMDb website. GLUE not only work closely with production companies to create visual effects, we also provide our customers with custom, bespoke idents which are tailored specifically to suit and promote your business. ← Should I use green-screen, build a set or shoot on location? That is the question!